1900 Orient - Paul BrodieFlashback Fabrications Ltd. 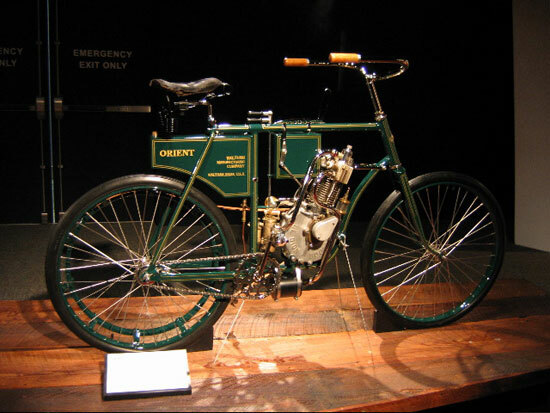 The Orient was the first commercially manufactured motorcycle in the USA. Waltham Manufacturing of Waltham Mass. employed Oscar Hedstrom as a consultant during this period. Hedstrom went on to develop the far more successful Indian brand. This Orient was found in unrestored condition by P. Gagan at an AMCA swap meet in Oley, PA. 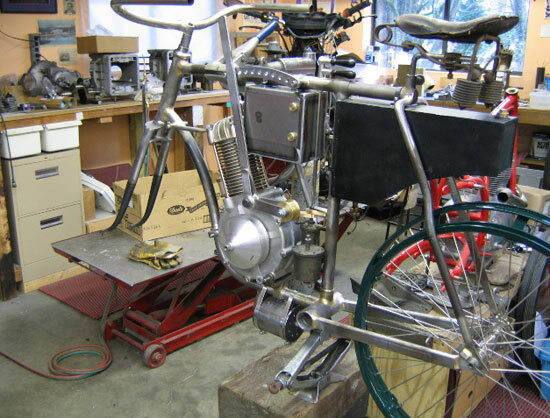 The engine was in good shape, but the frame and forks had been partially fabricated incorrectly. Only part of it was original. I remade the frame, forks, as well as all controls and linkages, from pictures and info supplied by Gagane. The resultant bike is the earliest known Orient, so is therefore perhaps the earliest surviving two-wheeled commercially built American motorcycle. The engine is a French de Dion-Bouton. This project served to get me a little deeper into antique bikes. I learned Orients were heavy-duty motorized bicycles with the related motorcycle pieces strapped on here and there. There was no sense of integration, or flow; motorcycle production was in its absolute infancy. And therein lies its beauty. Everything is in plain sight. The lever for the brass idler pulley just forward of the battery box, ahead of the fuel tank under the seat. Surprise is the carb, down low, behind the crankcase. Muffler is strapped under the frame, very bottom. These are the levers used to control the carb. One is for the gas, the other for air. 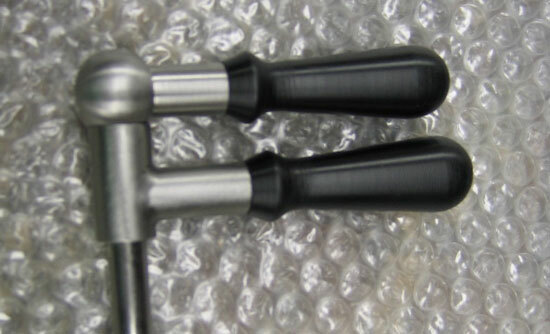 Materials are stainless steel and black delrin. Below the levers is a tube with a shaft inside. The s/s ball was machined free-hand. Fun job, but tricky. 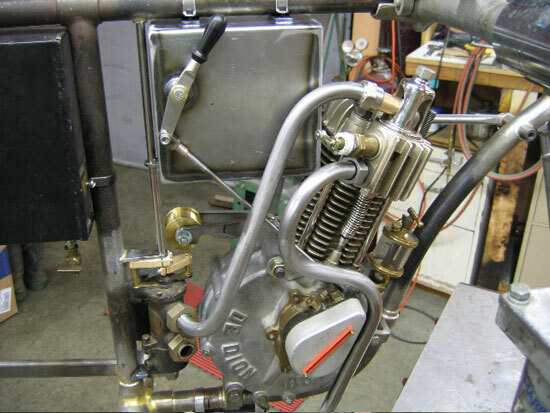 Here is the tube / shaft connected to the two levers controlling the carb. The intake tube is very long, and the mixture has to go up quite a distance—not good for performance. Old style sparkplug is under the intake valve, and the exhaust pipe is the lower tube. The lever on the side of the battery box advances and retards the spark, which sometimes did more for acceleration than moving carb levers; fuel systems hadn’t achieved any degree of sophistication at the turn of the century. Installed at the Guggenheim Memphis ’05 and Orlando FL, ’06.